We all want to have our best hair possible – but are we sabotaging our own efforts with bad daily habits? Avoid committing serious hair crimes that help cause the bad hair days that we all dread by reading up on the below common hair mistakes! Do you straighten, curl, or blow out your hair on one of the highest heat settings possible? If so, you’re committing a serious hair crime. It’s a common misconception that our styling tools won’t work as well if they aren’t as hot. WRONG. Your tools will still do the trick on the medium heat settings and it will save your hair some serious damage in the long run, says Lara Parker of Loxa Beauty. Have you ever sprayed your curl while it’s locked into the iron and heard that sizzling sound? That is literally the sound of your hair frying. When the alcohol in hairspray comes into contact with the intensity of your hot iron…it burns, says Parker. Choosing the correct brush style and barrel size (for your hair) will make or break your blowout, says Drybar founder Alli Webb. Just remember – the smaller the barrel the more curl and body you can achieve. The larger the brush, the straighter the hair. Most of use take way too big of sections (i.e. too much hair in the brush) making a big ‘ol, frizzy mess… Best to work in 1-2 inch, manageable sections, says Webb. 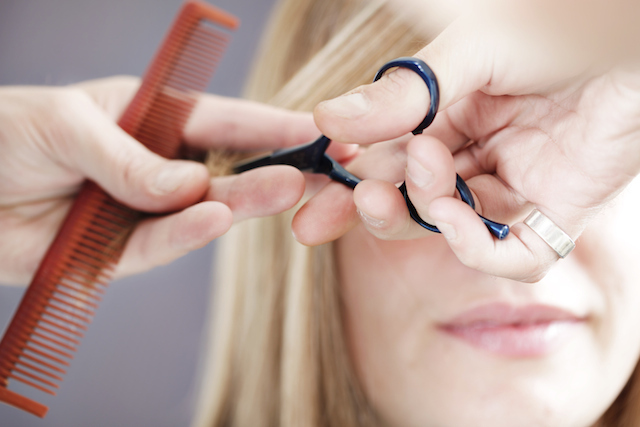 Don’t rush, make sure each and every section is 100% complexly dry before you finish your blowout, says Webb. First step is picking a shampoo that is correct for the pH balance of your hair and scalp, says Mia Moore of Pierre Michel Salon. If you color your hair, use color-safe or sulfate-free shampoos that are gentle detergents and protect color from fading. If your hair needs hydration, look for nourishing shampoos. Moore likes to use effective, natural products. Coconut, Awuipuii, and aloe based shampoos load the hair with moisture. If these make your roots too oily, switch to a cleansing shampoo (typically these have sulfates) and a moisturizing conditioner through the ends. The next big mistake is how you actually shampoo your hair. Work up a generous lather by scrubbing every part of the scalp with your fingertips. Stimulation increases blood flow by bringing nutrients to the hair follicle making it healthier. Do a thorough rinse to wash away any debris and detergent. Condition the shaft or dry areas and rinse thoroughly. Properly cleaned hair dries faster, has more volume and maintains a style longer. It causes a lot of friction. When you sleep and move your hair it can cause a lot of frizz at the back of the head. Dry your hair before you sleep. Some people get lazy at night and do this but it only ends up causing more work for you in the morning. You will have to work on your hair twice as long to get the frizz out. The problem is when you go to bed with your hair wet the cuticle is not quite sealed and with all the friction from moving around at night, it can cause frizz, says expert stylist, Nunzio Saviano. It’s a common misconception that our hair, like our bodies, needs to be cleansed every day. It doesn’t. The only thing you’re doing when you wash your hair every day is stripping it of the essential oils it needs to remain healthy, Parker says. If your unwashed hair is driving you crazy, try some dry shampoo. In all honesty, you probably should wait until your hair is 70-80% dry before you begin to brush through it. Any time before that could mean you’re brushing out the conditioning treatments and good oils and nutrients, Parker says. Allow your hair to breathe for a little bit if you have the time. You’ll save your hair later. Imagine a sponge: when it is bone dry, it can soak up a lot more water than if it was already dampened, so we are applying the same concept to your hair. If the hair is already wet, it won’t soak up as much of the chemicals that are in the pool water that cause that greenish tint. Jill Marcordes, Executive Director of Cosmetology & Nail Technology at Tricoci University of Beauty Culture recommends using a spray bottle filled with distilled water – distilled water will block the chemicals from making their way into the hair fiber – but regular tap water will do fine too. Work it in your favor by playing up the texture and taming those pesky flyaways with a hair serum or oil, says Head & Shoulders celebrity hairstyle Sunnie Brook Jones. The foods you put into your body are reflected in your hair, skin, and nails. Food that carries B6 and B12 vitamins like rice, peppers, and strawberries help create red blood cells, which makes hair healthier and grow faster, says Jones. Who can blame you? Girls love throwing their hair up in a ponytail after a long day. But this is a habit we all need to break. Hair ties are not our hair’s friend. They can cause serious breakage which causes flyaways and frizz. If at all possible, cut way back on the hair tie usage and look into clips, says Parker. Clairol Color Director James Corbett has some tips for selecting a shade that will complement your skin tone. If your veins are blue or purple, you have a cooler tone and want to pick a warm shade to complement you skin with the words “warm” or “golden” in the name. He recommends trying a shade like Clairol Natural Instincts Sunflower or Spiced Cider. If your veins appear green, you have a warm skin tone and want to pick a cool shade with the words “cool” or “ash” in the name. He recommends trying Clairol Natural Instincts Linen or Clove. When coloring your hair at home, always follow the instructions to avoid mishaps! Remember to also only go 1-2 shades lighter or darker than your current shade – dark brunettes, please do not try to go blonde yourself! If you’re looking for more dramatic results, consult with your colorist first. Clients always use the term “cheating” on their stylist and this can be true. Relationships do develop and as they deepen the stylist naturally gains a greater understanding of what really is going to make that client happy. Finding a stylist who has good communication and the skill to give the client what they want is a must. But once you find a great stylist stick with them. If the last cut wasn’t as great as the one before communicate why, says Moore. A few snips from the guy down the street in the wrong places can ruin a cut.